While the West hunts Islamic terrorists, a new anti Western power bloc is building in Asia. The Shanghai Cooperation Organisation is a huge and growing economic and defence bloc linking Russia and China plus several "former" communist and Islamic Asian states. The communist movement quite rightly sees this as a very positive development that could help tip the balance of power in their favour. Below are excerpts from an article on the SCO in the latest issue of the Communisy Party of Australia's Guardian newspaper. The annual summit meeting of the Shanghai Cooperation Organisation (SCO) held in Shanghai in the middle of June adopted a declaration that sets out the principles that should govern the relations between countries in the future. Once implemented by all major countries they would set the world on a new path and would guarantee peace and economic and social development such as the world has never seen before. The heads of state of China, Russia, Kazakhstan, Uzbekistan, Tajikistan, Kyrgyzstan, Iran, Mongolia, Pakistan and Afghanistan attended the meeting. India was represented by its minister of Petroleum and Natural Gas. Taken together they represent almost half the world’s population and have at their disposal enormous riches in mineral and energy resources, agriculture, technology, manufacturing, heavy industry and military hardware. Afghanistan, Iran, Pakistan, Mongolia and India at present hold observer status but several of these countries have applied to become full members of the SCO. The media in Australia has almost totally ignored this important summit meeting hoping to keep the Australian people in the dark about it and even the existence of the Shanghai Cooperation Organisation and its important influence on world affairs. China’s President Hu Jintao expressed the hope that the international community could respect the social system and road of development independently chosen by SCO member countries and observer countries, respect their internal and external policies of peace, friendship and cooperation based on their own domestic situation, and create a harmonious and easy environment for their development. He said the establishment of the SCO was an "historic decision" and that its successful experience can be condensed to one point, that is, to unswervingly advocate and practice mutual trust and benefit, equality, respect for cultural diversity and a desire for common development. 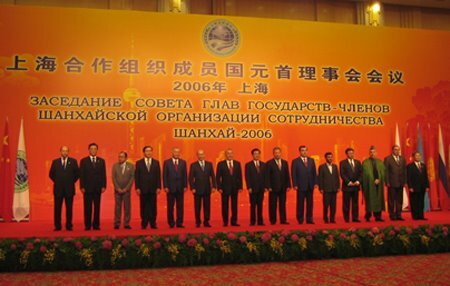 The SCO took a positive attitude to the United Nations as the universal and the most representative and authoritative international organisation, which is entrusted with primary responsibility in international affairs and is at the core of formulating and implementing the basic norms of international law. In carrying out Security Council reform, the principles of equitable geographical distribution and seeking the broadest consensus should be observed. No time limit should be set for the reform, nor should a vote be forced on any proposal over which there are major differences. The SCO holds that the next Secretary-General of the United Nations should come from Asia. Why do you think the media has ignored this one Trev?. There has been a little bit of comment. For a long time the media ignored the "pink tide" in Latin America too, but are now starting to wake up. Certainly the commies are taking it seriously. KGB defector, Anatoly Golitsin, postulated in the '80s that a Russian/Chinese, pan Asian/Islamic Alliance wold arise to challenge a much weakened West. He was a bit iffy on which way Japan would go, but he thought India and Indonesia would sign on. Perhaps we are seeing his predictions unfold? Those words will return to haunt her - if she had any shame at all. Can't see Helen joining the Territorials like Heather did, can you Ex? She is an anti-military peace-nik, always has been.